SweeTreats Ice Cream franchise business opportunity. Free SweeTreats Ice Cream business franchise information. We believe SweeTreats is on the cutting edge of dessert experiences. SweeTreats started in 1989 as an ice cream/yogurt shop. 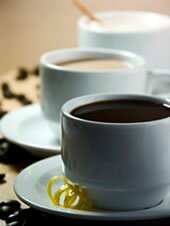 Today, it is also an innovative coffee shop. Combining two of <?xml:namespace prefix = st1 ns = "urn:schemas-microsoft-com:office:smarttags" />America's favorite comfort foods just seemed like the perfect marriage. Ice cream has always been a favorite of children young and old. And we begin with the best Mayfield Dairy Farms has to offer. Our yogurt is a favorite too. It is a hard packed, active culture yogurt, not the reconstituted yogurt that is available at most shops. The taste remains as pure as possible. The exciting thing about our ice cream is that we custom blend each flavor to order. We start with vanilla or chocolate ice cream or yogurt, and blend in fresh whole fruits, nuts, and chocolates, among other ingredients. You can "let your imagination run wild" with ideas. How about chocolate peanut butter cheesecake? Or raspberry toffee? Or pineapple macadamia coconut? Each flavor is blended right before your eyes. Our proprietary blending machine guarantees that your cone will be ready quickly, and that the texture, taste, and presentation will surpass all other mix-ins. SweeTreats is an experience unlike any other because our goal is that every person visiting SweeTreats leaves a little happier than when he or she entered. We like people to have fun with our product and feel at ease in our store. We like to be a destination point, a choice, a place to meet family and friends, and feel welcome. Training: Our company-owned store is located in Highlands, North Carolina, and we offer training sessions, which give you the benefit of hands-on experience. These sessions can be coordinated with your schedule. We will provide you with a list of vendors, assist you in locating equipment, review and assist with shop location, floor plan, and store image. We want you to be successful and we believe that the better we train you the better you will be able to serve your customers and avoid some of the trials and errors we experienced when first opening. We will gladly answer your questions and offer assistance as necessary. Registered Name and Proprietary Equipment: You have the right to use the registered SweeTreats name and logo to promote your business. 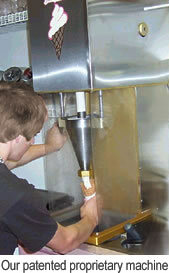 The flavor maker/blending machines and cone bakers are made especially for SweeTreats. There is not one available "off the shelf" that will work properly without major modifications. You will be provided with two blending machines and two cone bakers to operate your business; however they remain the property of SweeTreats in the event you dissolve your business. We will be happy to assist you in locating other necessary equipment. We will establish a non-compete area in which no other SweeTreats will be permitted to operate. Training in store operations and procedures: This will include 5 days training at our SweeTreats store in Highlands, 2 days training at the Greenville location for the coffee operation, 5 days training at your store location, and on-going assistance as deemed necessary by both parties. Annual visit and review of operations. Most importantly we expect you to enjoy what you are doing. Successful franchisees look forward to operating their SweeTreats, meeting with and serving their customers. We believe service is as important as the wonderful product we sell; therefore, we expect you and your employees to make every person that enters your store feel special. We expect everyone to go the extra mile to achieve 100% customer satisfaction. Most businesses fail due to lack of operating capital, so we expect you to have adequate capital to carry the business through its early stages and during slumps. We expect you to pay vendors promptly and use good business sense in operating the business. We expect you to contact us if you run into problems or have questions concerning operations. We can assist you with issues concerning employees, location of vendors, provide tips and shortcuts, and analyze your financial records to help you keep expenses in line. We expect you to use your creativity and imagination. SweeTreats is always evolving. We come up with new ideas based on customer requests and employee ideas. Certain products sell better in one area than in another and you are encouraged to contact us to discuss ideas for new items. We expect you to take pride in your struggles and successes, to enjoy your business, and to look forward to a bright future. To learn more about the SweeTreats ice cream franchise opportunity, simply complete the form below.